The popular Science Week is back for another week-long program of exciting Science-related activities from April 6th -13th. This program is free to everyone and no registration is required. The workshop are geared toward elementary school aged children but all ages are welcome. No day care is provided so parents must accompany their children. 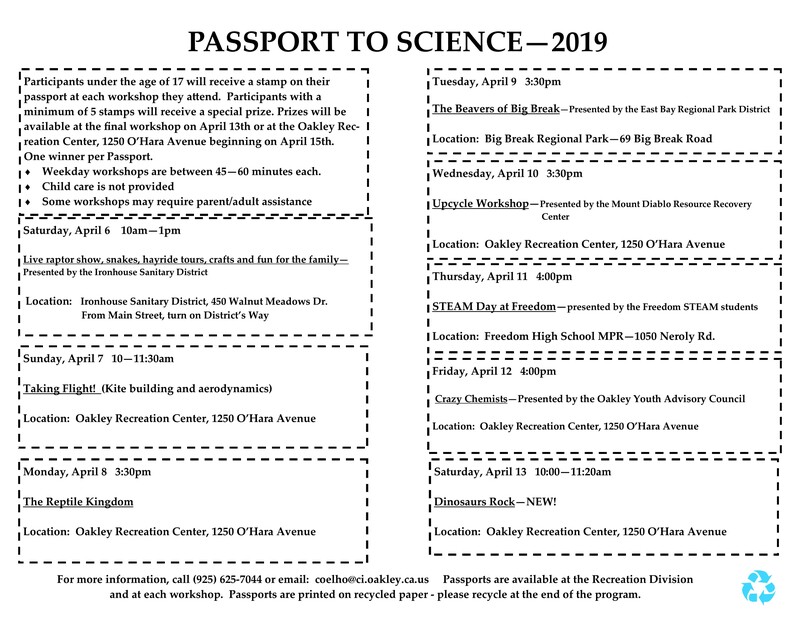 The “Passports to Science” will be available at City Hall and also at each workshop so be sure to pick up a “Passport” to collect your stamps. As usual, those with 5 or more stamps will receive a special prize at the conclusion of Science Week. Today’s workshop is presented by the Ironhouse Sanitary District and includes a live raptor show at 11:45, live snakes, hayride tours of the facility as well as crafts, activities and giveaways. Fun for the entire family! The address is: 450 Walnut Meadows Drive. From Main Street, take District’s Way under the railroad over crossing.